Modern family house in the heart of the Normandy countryside, set in a natural meadow with a stream and small woodland area. Ideal for a family break with outdoor activities, or simply as a quiet restful rural retreat. Ground floor: sitting room (with sofa bed), large kitchen-dining room with fridge, washing machine, microwave, and 5-hob gas cooker, with electric oven. The sitting room has an open fireplace - an adequate supply of logs is provided for additional comfort in cold weather. Rear lobby with WC, and staircase to first floor. First floor: double bedroom, bathroom & WC, attic bedroom with 4 single beds (2 may be made into another double bed). The meadow is extensive, including a well, a stream and a hay field. The lawn adjacent to the house has a BBQ for alfresco dining. Domjean village is a 5-minute walk. It has a boulangerie, supermarket, bar-tabac, hairdresser and a great local restaurant. The 18th-century church has modern frescos and a carillon. Domjean was recently awarded its 4th rosette as a ‘Village Fleurie” – Village in Bloom. It hosts an art exhibition during the summer each year. The village gardens include a children’s playground and mini-golf, as well as a small campsite. There are many attractive walks nearby, as well as stunning views from the Roches de Ham. 'This is our 3rd visit to Domjean. Although winter, the house was warm & cosy. We look forward to future visits.' Hazel & Les Phillips. 'We have had a wonderful week here in Domjean' Ann & Cliff Ashdown. 'We had a fab time. The house was cool. Fantastic garden.' Megan John (Aged 9). 'We had a marvellous week! Very cosy house, fully equipped. Lots of great places to visit as well.' Mr. & Mrs. Van Nies & Mr. & Mrs. Van Daal. 'Our 6th visit to Domjean and it's like coming home again..... all in all a brilliant time!' Noble & O'Hanlon families. 'A beautiful house and large garden with peaceful surroundings with lots to do. We have had a great relaxing time.' Saville Family. 'We have had 5 wonderful nights here. The walks around the village are super, beautiful countryside. Thank you for letting us use this house, it has been a relaxing break.' Ashwood family. 'We all had a fantastic time at Domjean - our 3rd stay here.' The Kinch family. 'We spent a gorgeous holiday, sightseeing - Bayeaux, Omaha Beach, Coutances, Villedieu, and now off to Paris for 3 days.... Selim's 1st trip to Domjean, it was perfect.' Selim Ali & Jess Tickell. 'Had a wonderful fortnight. Weather has been very hot most days, so we've been lazy & chilled.' Liz & Martyn Noble. 'Lovely to be here again - thank you for letting us use this lovely house.' The Baker family. 'Great stay in this wonderful peaceful haven!' The Hawkins-White family. 'Wow, what a place! So pretty & peaceful. The dogs enjoyed all the walks & meeting the cows.' Diana Curtis. 'We have had a wonderfully relaxing week and wish we had booked for two! What a wonderful spot - great for a family holiday. We hope it won't be long before we return.' The Wilson family. The property is owned and enjoyed by our whole family: my wife Belinda, our 2 daughters, as well as 3 sisters and their families - we are all joint owners. Our extended family - 6 cousins and their families - were also owners up until 2008 and continue to enjoy visiting Domjean. We visit the house each year, often more than once - a quick hop across the Channel from our home near Guildford, Surrey. Domjean is a beautiful, peaceful, rural village with all the necessary amenities for a quiet relaxing holiday. At the same time, it is located conveniently near to many areas of interest: the beach, the river, the seaside, the WWII Normandy beaches, Norman history and churches - never a dull moment. The house is very comfortable and fully equipped for a self-contained break. Guests can make their own choice of sitting peacefully or making daily excursions. Bathroom 1 also provides a 'lazy sheila' dryer. Comfy sofas, with DVD/Video player, or simply curl up quietly with a book. Small library on bookshelves, as well as jigsaw puzzles and board games. 5 gas rings for "cordon bleu" cooking, if inspired. Large/wide electric oven, with rotisserie attachment to roast your own whole chicken. Kitchen/dining room table extends from 4 seats up to 10 seats, if required. Or simply use one extended end for a jigsaw puzzle. There is some games equipment in the shed - badminton, children's cricket - as well as deck chairs and loungers for a sunny afternoon. Tables and chairs for lunch/picnic al fresco. Paddling pool. What can I say about our lovely stay in this lovely country home. The house was big enough for our family of 7 but was snug enough to watch a film on the sofa and chairs. We didn’t use the fire as it was August but I could only imagine how magical it would have been on a winters night. The house has everything you need including a first aid cupboard and a garlic crusher and plenty of crockery for the table that seats 8. The house was clean and presentable and if I had to give the owners any feedback it would be to get some new photos as they do not do the place justice. The kids loved the grounds from talking to the goats and chickens next door to the well stocked shed with plenty of outdoor toys and some very comfortable sun beds for mum and dad. Perfect with a glass of wine and a good book or even just taking in the beautiful location. Indoors there’s a small tv, blu Ray player and a video player(my 8 year old was amazed by this as he had never seen one) with some classic movies including lots of Disney films to watch. There was also plenty of games insides to play. Location wise you have a small bakery, supermarket tabac and restaurant a 5 minute walk away. We didn’t spend any longer than an hour getting to any of these places so we were really pleased. France is quite expensive so we ate in for quite a few nights. The oven is amazing and you have a carrefoiur Aldi and Lidl within 15 minutes if you are on a budget. All I would add is a massive thank you to the owners. The communication has been brilliant including a really useful welcome pack via emai and plenty of local information in the house. It is a perfect 'get away' with no Internet and no TV to disturb. The house has everything you would need to be comfortable, with great walking on the doorstep and Roches Des Ham just down the road for wonderful views and river walks. Domjean is a small French village with the essentials (bar/restaurant, bakery, and small supermarket) and is just full of flowers. The garden is huge, well kept and full of space to follow the sun on your lounger. Birds, church bells, sheep and goats add the background sounds. We had no children but would imagine they would adore the big garden to run around in and the farm animals nearby. When we first arrived we were amazed by the garden, it's trees and surrounding meadow. The house was lovely and spacious, although a little musty at first after opening the windows fresh within an hour! We enjoyed cooking in the kitchen, it had everything we required plus more. All the instructions left by the owner were easy to understand and we had no problems. We loved eating both outside and on the big kitchen table, it had a real homely feel. Upstairs the bathroom was far bigger than we had expected, so with a family great to be able to help with showers etc. We had hot water when ever we needed it. Both bedrooms were a good size and the children loved being in the sloped roof room! There was good storage for all our belongings. The only thing I would say is we didn't register how dark it would be in the country and didn't bring a nightlight for the children so ended up having to leave the stair lights on. Like I say something we should have thought of. The location is excellent, Domjean is lovely and has a shop, park and bakery we visited often. We never made it to the restaurant, maybe next time! We were at the beach within 45 mins and visited Bayeax, Coutances and St-lo with ease. The goats and chickens in the neighbours garden were a massive hit with our children, they even learnt to speak goat?! They also enjoyed using the bucket and spades and ball games in the shed. We would definitely stay again as we all felt refreshed and like we'd had a holiday. Thank you. Lovely house with large beautiful setting with goats, chickens, cows and sheep for neighbours. Plenty of room. Ideal for a holiday with no Wi-Fi, tv or Xbox! Lots of family time playing games and reading. 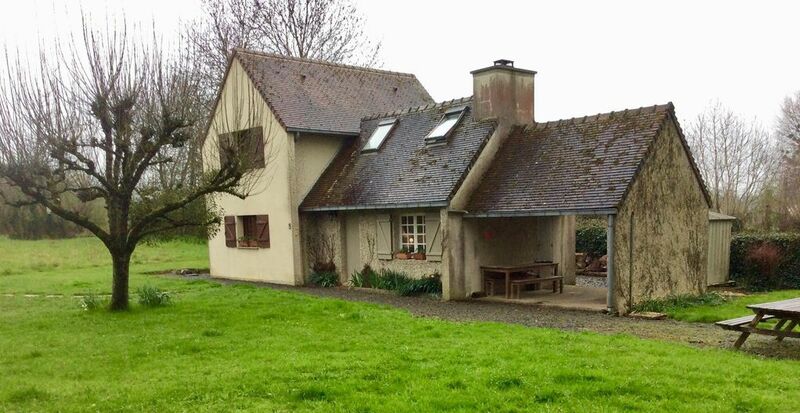 Ideal location for visiting all the Normandy beaches which are a must. Weather wasn't great but improved at the coast. Would recommend this house for a chilled and peaceful holiday. We spent a week in Domjean before heading down to Paris for a week. The house is lovely and the grounds are beautiful. From here we had day trips to Mont St Michel, Granville and Caen, so it was perfect for exploring this part of Normandy. Everything we needed was available in the house, which is full of character, and made for a very relaxing week. We would recommend this property. Plenty of detailed information on tourist attractions will be found in the house, including market days (most local towns have a market day). Several notable towns are within reasonable driving distance: Bayeux, Villedieu, St. Lo, Caen, Deauville, St. Malo, and Coutances. Other places of interest include the spectacular Mont St. Michel and the WWII Normandy Landings D-Day beaches. The local area offers a range of activities, including horse riding (the National stud of France is in nearby St.Lo); fishing; canoeing at Pont Farcy; Caves at Caumont l’Avente; tree-to-tree/zip wire at Torigni-Sur-Vire; Bungee jumping at Hackett’s; Velorail and kayaking at Conde-sur-Vire; Zoos at Champrepus and Jurques; and beaches on the Granville coast.